Rafael has been an excellent instructor. He is detail oriented and very knowledgeable. Was always very calm & patient during the lessons even when I kept repeating the same mistakes. He keeps working on your mistakes until you start doing the right thing as a habit. He made sure I am familiar with most of the test routes which helped a lot. He is really a pleasant personality & driving lessons with him were fun; something I looked forward to. Rafael is a very professional, patient and helpful instructor - I very much recommend him. When I made mistakes, he made me analyze them, took me on the same route again and again, which helped me to correct those faults. He is a perfectionist; taking lessons from him and passing with four minor mistakes has made me a safe and confident driver. Excellent value for money; Rafael has been thoroughly professional and made sure to work on my weaknesses. I would definitely recommend him as a hard working instructor. I am chuffed to have passed my test today, first time lucky, with a couple of minors only, after just 10 lessons. I had decades of experience outside the UK but Rafael still taught me a lot and made me a much better driver. He would not let me get away with anything and that exactitude, professionalism and thorough knowledge of the test rules (and safe driving), are what makes his many trainees so successful. And the car is fabulous & a treat to drive! Rafael took me from being a bundle of nerves in a car to passing my test first time, and with just one minor! His friendly and helpful tuition was nothing short of superb. Whilst I'm glad to have passed, I will certainly miss my lessons and his dedication to helping me pass. Rafael is very analytical and patient with his approach to teaching. I particularly appreciated when I made mistake and he immediately asked me to stop somewhere safe and we talked about it and went on doing the route again and I got the chance to practice and correct my mistake. He was also very patient with answering all my questions - and I had a lot of them! I was very anxious and apprehensive about driving for many many years and the fact that I passed the first time within not even 2 months of starting my lessons speaks for itself and the quality of Rafael's teaching. Rafael is very professional, supportive and nice. My driving skill has become much better after practising with him. He is never late, always on time, focuses on my weaknesses and corrects them immediately. Because of him, I passed my practical driving exam shortly. 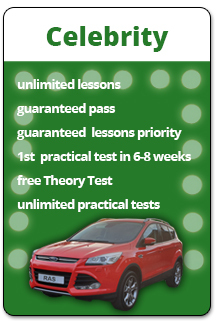 If you are looking for driving instructors in Cambridge, he would be the best for you. I had a wonderful experience with RAS Driving School thanks to my driving instructor Rafael. Rafael was an extremely patient and flexible instructor who was very dedicated to ensuring that in every lesson I was not only a successful driver, but always felt safe and comfortable in the car. He enabled me to take the learning at my own pace as well as ensuring that in each session I felt I had accomplished a great deal. I am now a very confident driver! Rafael is very professional, patient and nice. He carefully helps me to analyze the origin of my faults in driving and makes me to understand driving much better. I didn't expect I can pass so soon. Generally quite good experience. Rafael has been a very professional and patient instructor. I found learning to drive before extremely difficult, but he explained the finest details in a very clear way, and made it much more easy for me to understand. I made very fast progress with him. He knew all the test routes around Cambridge and made sure I was ready and confident before I took the test. In the end I passed with only a small number of minor faults. I passed today a new test with 3 minor faults. Raf is a very good teacher! He was thorough with his instruction and he adapts to the learner and made sure I understand. He thinks of ways to correct my mistakes. He doesn't just teach you to pass, he also teaches you to be a better driver. Thank you for all your help Raf. I took the new format test today with satelite navigation and passed very happily with just 1 minor. I am extremely pleased with this result and the time and patience Rafal had spent helping me improve my skills and ultimately my focus and confidence. He conducted all lessons in a very professional but also enjoyable manner, and explained the finer details to me, and erased any obstacles I had in my mind. He was very prepared for this new test format and I highly recommend choosing Rafal as your instructor. Rafael is a very helpful instructor. He is professional with all the test rules and test roads. I made very fast progress with him and I was able to pass driving test first time. I am very satisfied with Rafael. His method of teaching is good; while he is very hard working and keen to help. I am pleased with passing the test in my first attempt. It means Rafeal is a good instructor in every way. I am very obliged to have him as my driving instructor. All credit goes to him. Thanks to Rafael my life has changed! I was so nervous and Rafeal was excellent at keeping me calm. I feel like a safe and confidence driver. It was really nice to have Rafael as my instructor. He was patient with me. I took the Fast Pass Course and everything went well. I passed the test first time which means to me, the training was good, and the test was quickly booked too. Rafael has been great and extremely patient with me. I'd always been frightened of driving but I've passed first time only with a few minors! Rafael was thorough and specific when teaching me all the manouvers and safety processes, and we did all the learning on test routes so I knew them well before the day of the exam. Not only have I passed the test, I can definitely say I feel confident and safe to drive on my own. I went on the Jaguar Celebrity Course and it was perfect for me. The instructor was excellent as he taught me everything from the beginning, and I passed with only 1 minor! Having lessons everyday was a real help, as I could improve from day to day, and now feel confident when driving. I always made sure I was on time for lessons and in the end the result was fantastic. Passed first time! I took lessons in the Jaguar because I was planning a bigger car after passing my test. Driving the Jaguar was an unforgettable experience - I find it easy to drive an estate car for my job now. Rafal was a good instructor. He improved my language for driving. The car was nice and comfortable and I knew the roads and the test route well. Passed first time with good result. Rafael as a driving instructor has been great, he helped me improve my driving skills needed for everyday driving, and it was not limited to passing the driving test only. He will make you keep doing same manoeuvre over and over again unless you are perfect and confident on them. Also I hadn't driven car in my life before, but he was encouraging me even when I made mistakes. I took a Fast Pass Course and I passed fast, first time with one minor only! Very happy about it. Thanks a lot to Rafael, my driving instructor. I feel I was very well prepared and had a lot of confidence during the test. I took the Fast Pass Course Very happy to pass the test first time. It only took several weeks to qualify. Super nice course. Highly recommend! Fast Pass Course - 100% successful and flexible. I could match my working pattern. My progress was systematic in safety, controlling the car, and planning the routes. Rafal was patient as a driving instructor and identified all the weak points, then helped me to overcome them. This course gave me the best chance to pass first time and I did it! The instructor was patient and helped me to drive better every time. Happy to have passed my test today! RAS Automatics driving instructor helped me with driving and improved my English. I have passed! First time! Thanks to RAS Automatics DS. I have been very pleased with the driving instructor teaching skills and with the fabulous car they provide for the learners. I am very happy with passing first time! Celebrity course was best for me - it was quick, intensive and effective. I would highly recommend Rafael to my friends who wish to learn to drive. I passed my driving test on 22.08.2016 in Cambridge. I was very anxious about the very busy traffic and cycle lanes in Cambridge. I took up the celebrity course - the intense 3 hour sessions were very helpful in building my confidence and to overcome my fears. Rafael is a excellent instructor. Rafael is an excellent driving instructor. He always checks what is our understanding level and teaches accordingly. He makes sure that we get all the manoeuvres right and gives ample training. I am very happy and very pleased with his instruction - I got through the test first time confidently, all credit goes to Rafal. I took celebrity package with him and it's the best option for all new drivers. After a few attempts I felt it was impossible to get my driving license. However, I found Rafal from RAS Driving School and he made it possible! Excellent teaching with pin point analysis on driving faults. Rafal increased my confidence in driving safely on the roads. Thank you. I have passed the practical test first time after completing intensive course with RAS DS. The three hour lenght lessons were useful and I felt comfortable and relaxed with the car, which was integral to passing today. Many thanks to Rafal for his hard work! Now I can cart my band around without having to impose on my parents for lifts - a great relief! I can't believe to have passed my driving test today. I thought I would never learn to drive. Thanks to RAS Driving School Cambridge it all came true. I feel I am now well prepared for independent driving. After all, this is what it is all about: safe driving. I can trully recommend Rafal. I am very happy I have passed my driving test first time. My instructor Rafal prepared me very well for the exam. I made only two minor faults which means the effect of tuition is very pleasing. My progress was quick as I practiced regularly and completed the course in three months. The level of explanation during the lessons is high and learning materials are easy to understand. I recommend RAS Driving School to every learner driver. I am very happy today as I have passed my driving test first time with just two minors!! Rafal's teaching techniques are spot on; I have got no reason to complain. It was real professional tuition with explanation, books and diagrams. The effect was excellent: in three months I was ready for the test. I highly recommend RAS Driving School Cambridge. Rafal is a very good driving instructor, in fact an excellent one! His techniques are spot on and he is very reliable and punctual. I highly recommend service of RAS Driving School Cambridge. After I changed my driving instructor for Rafal I finally passed my practical driving test!!!. Thanks !! Driving lessons were carried out in a really great atmosphere and in a comfortable compact car. Now I am looking forward to do my Pass Plus as a colleague of mine saved around £400 on his insurance only because he had done Pass Plus course. I am going to do the same. I am very pleased with Rafal's driving lessons. I have tried two instructors before and finally found Rafal thanks to recommendation. The new training car - Seat Ibiza, is excellent to learn. Its modern features make driving pleasant and comfortable. Rafal is very professional and he pays attention to details of your driving style. I can't commend him highly enough. I was prepared for the driving test perfectly. I passed first time with no faults. I highly reccomend RAS Driving School to everyone who is learning to drive. You can't get better than training with Rafal. You will be pleased with the car - very good for learner drivers, and the atmosphere will be friendly and relaxed. Rafal is very patient and easygoing. I am very happy with my results. My parents told me I would never learn to drive. Thanks to Rafal, today - passing my driving test, we have proved them wrong! I tried two different instructors before, but Rafal is a thousand times better than others. His methods were very simple and successful. As an instructor he is very organized and systematic; he pays attention to every detail of your driving. I honestly recommend RAS Driving School Cambridge. Today, I have passed my driving test on first attempt! I would like to thank Rafal for that achievement from the bottom of my heart. The preparation went very smoothly and I enjoyed the driving lessons. For patience and teaching methods I would give Rafal maximum score - 10/10 points. Although I learned a lot already, next Saturday I am starting Pass Plus advanced course to get experience on motorways. I can truly recommend RAS Driving School Cambridge. When Rafal prepared me well I passed the driving test straight away! Preparation is everything. Rafal taught me a lot of things which I use not only for the exam, but all the time in my driving. The atmosphere during learning was cool and friendly. For the explanation of driving techniques I give Rafal 10 points out of 10 points. I recommend RAS Driving School Cambridge to everyone!. Great! With Rafal I passed on my second go. The driving lessons were stressfree and professional. Rafal is an easygoing instructor preparing pupils well for the driving test. The quality of teaching was very good. I am very happy with my exam result and will gladly enrol on Pass Plus Advanced Course. Now, I want to get experience on motorway drivng and save on insurance in my first year. 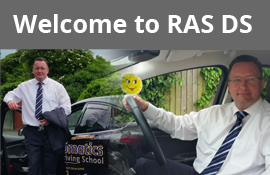 I think everyone will be happy to train with RAS Driving School Cambridge. Passed! First attempt! Almost perfect, only 3 minors, not bad at all. I have been with Rafal for about one and a half months and used " Early Birds" sessions. The lessons were great - very professional; sometimes harsh, but it made the Driving test a breeze.I would recommend this guy to the whole world! I am delighted to have passed on first attempt! I feel Rafal prepared me very well; I couldn't escape with one single fault and it paid off. Lessons with Rafal looked exactly as the test itself so there was nothing that would surprise me throughout the drive. I have been with RAS Driving School Bedford for about five months and now I am eager to sign up on a Pass Plus course. My advice is not to rush, but trust professionals like Rafal to train you well. I am really happy to have passed on first attempt. I found driving lessons with Rafal very professional, but at the same time enjoyable and relaxed. I quickly made progress and it didn't take long to be ready for the driving test. 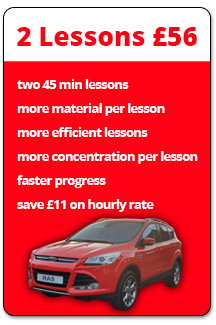 I regularly benefited from extra lessons at £12 an hour during 3 hr sessions, and drove a lot round Cambridge. I would highly recommend RAS Driving School to any students who want to be safe and confident drivers. I can't believe to have passed on first attempt. It's amazing! Initially I felt driving is a very stressful experience, but when I started tuition with Rafal I changed my mind. Rafal clearly explained how to drive safely and confidently and prepared me well for the test. Driving is a pleasure now. ' 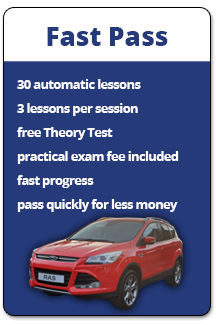 If you want to drive stress free, book lessons with RAS Driving School Cambridge - that's my advice. I am delighted to have passed the driving test first time! The route was difficult, but I felt well prepared. I am very happy with the quality of tuition and Rafal' s approach to pupils. I would highly recommend RAS Driving School to all learner drivers. Driving lessons with Rafal were professional and stress free. He was very patient and helped me progress with skills. Rafal can perfectly adjust the level of instruction to the needs of pupil. I felt I could easily achieve required standard with RAS Driving School Cambridge. I gladly signed up for Pass Plus to save on insurance and get experience on motorway driving now! From RAS: We went on a very difficult driving test route, but the examiner commented on Bartek's drive as very pleasant and commended him for excellent observation skills. Considering the level of difficulty and the amount of manoeuvres - two on one test, the result of not more than five minors is very pleasing. Congratulations Bartek! David achieved very good result on the test - below 5 minors - and passed confidently. In behalf of RAS Driving School Bedford I would like to congratulate him for his determination to acquire all of the skills necessary for safe driving for life. Well done David and see you on Pass Plus! I really enjoyed lessons with Rafal and I felt well prepared for the driving test. The car is very nice to drive, too. We covered every road I drove on in the test. Overall it was a very good experience. Rafal is a very good driving instructor. I highly recommend him to everyone. I learned all the manoeuvres first time and understood 100% how to do them. I knew the test routes in Cambridge well and translation during the test helped me to relax, so I passed on first attempt with just few minors on the assessment sheet. The cost of the course is worth the quality of provision, but every third hour I got for £12 as advertised. Altogether I am very happy.